General Electric ($GE) may be trying to sell its capital aviation services business (GECAS). On Jan. 21, the Wall Street Journal reported that Air Lease Corp. wasn’t interested in buying GECAS. The next day, Barron’s wrote about value of GECAS. GE has several operating segments: Power, Renewable Energy, Oil & Gas, Aviation, Healthcare, Transportation, Lighting, and Capital. Their performance is reported in the segment footnotes in GE’s 10-Ks and 10-Qs. GECAS, however, is part of GE’s Capital segments — so it performance was not separately reported in those disclosures. Nevertheless, GE does report information about GECAS. You just need to know where to look. The information can be found in different places. GE has been reporting GECAS’s performance in “sub-segment” information included in 8-K earning releases, or in the Management Discussion & Analysis (MD&A) section of its filings. More information about GECAS can be found in Supplemental Information About “The Credit Quality of Financing Receivables and Allowance For Losses, as GE reports GECAS’s receivables”. So, how to make sense out of it? Calcbench can help. But in 2016, that reporting scheme changed. 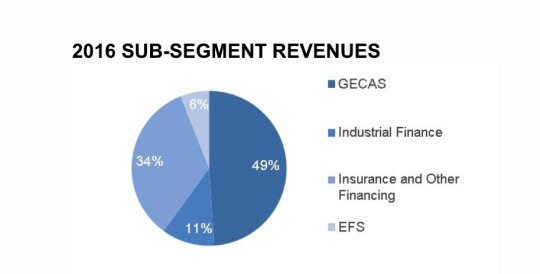 GE disclosed GECAS in a new format (which Calcbench also has). Now it’s possible to assemble enough information to piece together a valuation framework for GECAS based on historical revenues and some profit levels. 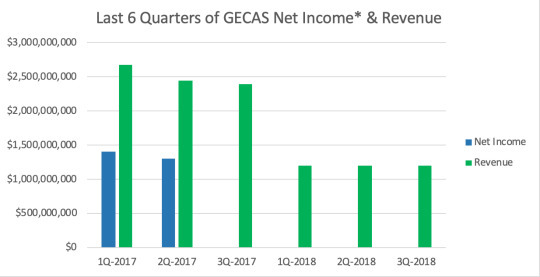 *Note that in third-quarter 2017, GECAS stopped explicitly disclosing net income. It just goes to show that while companies might change up their reporting, often times you can find the insights you want, by pulling together pieces of data sprinkled across multiple disclosures. Calcbench lets you do that.